mt. 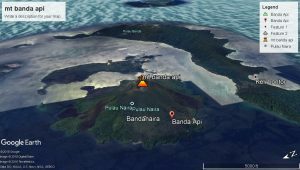 Banda Api is at least the fourth generation of ancient volcano mt Lonthor. Dr.R.D.M.Verbeek a geologist at (1900) dubbed Gunung Banda-api as “Etna van Indonesie” (Mount Etna in Italy is famous for its distinctive eruptions, which are bursts of fire one after another like fireworks at night). mt Banda-api appears from the northern end of a series of volcanoes located in the arc in Banda Volcanic (Van Bemmelen, 1949, p.219) The arc was formed approximately 1.5 million years ago, the mechanism of its formation is complicated to look at and the theory of plate tectonics. The interaction between the main plate (Pacific, Indo-Australia) with several micro plates and the influence of transform Irian faults and other local faults caused the complex of the region to be seen from the perspective of regional geological structures. This event caused the area of ​​the Banda Arc and the surrounding seas to be a source of tectonic earthquakes.